Billy Graham, widely touted here in the USA as ‘America’s pastor’, died on February 21 at his home in Montreat, North Carolina. He was 99 years old. What Billy was selling to his audience was the ‘soul-saving’ tablet of Christianity, which he packaged as “crusades” from small events in towns across the USA to television sets around the world. Truly, he was a precursor of the Protestant televangelism that helped reshape the American religious and political landscapes. According to his ministry, he preached Christianity to more people than anyone else in history, reaching hundreds of millions of people either in person or via TV and satellite links. Billy Graham was called a preacher to presidents - Democratic and Republican alike. He started meeting with presidents since the tenure of Harry Truman. He played golf with Gerald Ford, skinny-dipped in the White House pool with Lyndon Johnson, vacationed with George H.W. Bush and spent the night in the White House on Nixon's first day in office. His son, Franklin, known more for rabid bigotry than anything good, is one of President Donald Trump’s highest-profile religious cheerleaders. Trump said on Twitter: "The GREAT Billy Graham is dead. There was nobody like him! He will be missed by Christians and all religions. A very special man." Trump has again misspoken bigly. No non-Christian will miss Billy G - a person who epitomized hypocrisy, let alone racism and bigotry. He was an opportunist. And that is not the sign of greatness. Sorry, Mr. Trump. The elder Graham was not a great man. Graham was against racial integration. He refused to participate in the 1963 March on Washington. When Martin Luther King Jr. (MLK) electrified the nation with his "I Have a Dream" speech Billy Graham was not impressed. He dismissed MLK's belief that protests could create a "Beloved Community" in America where even "down in Alabama little black boys and little black girls will join hands with little white boys and white girls." Long says Graham was a constant critic of the Black movement and tried to shift blame away from his native South whenever King shined a spotlight on the region's racism. Long says, "If Graham had come out vocally for King and the movement early on, he could have made a huge impact in advancing equality for all Americans." Graham despised all non-Christian faiths. He hated Jews. But outwardly, he appeared to be an avid backer of Israel. Like many evangelicals and Judeo-Christians of our time, a tour of Israel in 1960 cemented his support for the Zionist state, establishing the seeds of strong pro-Israel support that persist in that community until now. In 1967, he urged Israeli leaders not to yield to diplomatic pressures that could endanger the country’s security; such entreaties, commonplace now on the American right, were unusual at the time. He made a film, “His Land,” about Israel that continues to be screened among pro-Israel evangelicals. For his support of the apartheid Israel, Graham received awards from the organized Jewish community and was so beloved in its precincts that in 1994, when H. R. Haldeman, a former top aide to President Richard Nixon, revealed Graham’s lacerating anti-Semitism expressed in private talks with Nixon, the Jewish community dismissed Haldeman’s account out of hand. Initially, Graham claimed ignorance of the hour-and-a-half long conversation. However, the tapes from the Nixon Library released in 2002 validated Haldeman’s account. In the audio tapes Graham could be heard referring to Jews as pornographers and agreeing with Nixon that the U.S. media was dominated by liberal Jews and could send the United States "down the drain." ''They're the ones putting out the pornographic stuff,'' Graham said to Nixon - "the Jewish stranglehold has got to be broken or the country's going down the drain,'' he continued. 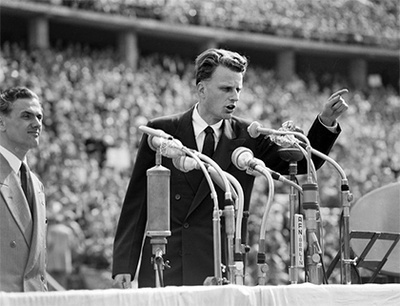 “In light of the Biblical endorsement of rulers, Graham supported police repression of Vietnam war protesters and civil rights marchers, opposed Martin Luther King’s tactic of civil disobedience, supported South American despots, and publicly supported every war or intervention waged by the United States from Korea forward,” writes Cecil Bothwell, author of The Prince of War: Billy Graham’s Crusade for a Wholly Christian Empire (Brave Ulysses Books, 2007). Graham was an enormously success story. What is, however, not known much is the fact that Graham first gained national attention in 1949 when the publishing magnate William Randolph Hearst, searching for a spiritual icon to spread his anti-communist sentiments, discovered the young preacher holding forth at a Los Angeles tent meeting. Hearst wired his editors across the nation, “puff Graham,” and he was an instant sensation. Hearst next contacted his friend and fellow publisher Henry Luce. Time and Life were enlisted in the job of selling the soap of salvation to the world. According to Bothwell, Time, alone, has run more than 600 stories about Graham. It was not the only time that Graham had encouraged a president to go to war. He gave his blessing to every conflict under every president from Truman to George W. Bush, and most of the presidents, pleased to enjoy public assurance of God’s approval, made him welcome in the White House. Bothwell writes, “Graham excoriated Truman for firing General Douglas MacArthur and supported the general’s plan to invade China. He went so far as to urge Nixon to bomb dikes in Vietnam—knowing that it would kill upward of a million civilians—and he claimed to have sat on the sofa next to G.H.W. Bush as the bombs began falling in the first Gulf War (though Bush’s diary version of the evening somehow excludes Graham, as does a White House video of Bush during the attack). “Graham endorsed and courted Eisenhower and compared a militaristic State of the Union speech to the Sermon on the Mount, fanned anti-Catholic flames in the Nixon-Kennedy contest, backed Johnson and then Nixon in Vietnam, lobbied for arms sales to Saudi Arabia during the Reagan years, conveyed foreign threats and entreaties for Clinton and lent his imprimatur to G.W. Bush as he declared war on terrorism from the pulpit of the National Cathedral. Billy Graham approved of warriors and war, weapons of mass destruction (in white, Christian hands) and covert operations. He publicly declaimed the righteousness of battle with enemies of American capitalism, abetted genocide in oil-rich Ecuador and surrounds and endorsed castration as punishment for rapists. A terrible swift sword for certain, and effective no doubt, but not much there in the way of turning the other cheek,” writes Bothwell. It was because of ‘crusading’ message of southern preachers like Graham, Christian evangelicals – who believe that religious conversion or a personal ‘born-again’ experience leads to salvation - are America’s most powerful religious affiliation today. As a group, the white evangelicals form one-fifth of all registered voters in the United States and make up one-third of all voters who identify or lean Republican. [Note: Compared with other high-income nations, the U.S. stands out as exceptionally religious. Of the 70.6% of Americans who consider themselves Christian, evangelism has consistently been the most popular denomination.] In fact, at least one quarter of the population in nearly 30 U.S. states is affiliated with the evangelical faith. In every way, Graham was the spiritual father of today’s right-wing religious leaders and the evangelicals who so inhabit the national conversation. It goes without saying that without the support from the evangelicals Donald Trump would not have been elected president of the USA. And that is the chilling fact as to the toxic influence of ‘crusading’ pastors like Billy and Franklin Graham who have had contributed to the meteoric rise of xenophobia, religious hatred and racial violence against the minorities. Graham’s comments deserve our full scrutiny. What were we to make of a preacher who insisted that his words didn’t reflect his beliefs? Were we to believe him then or later, on other matters? Graham’s despicable hypocrisy nevertheless helps to explain why the evangelicals would have no moral qualms of electing some of the most immoral, adulterous, authoritarian and least churchly people to the public offices, of course, as long as they espouse ‘crusading’ mentality. Seemingly, they are ready to summon the devil if it promises to do the Lord’s task. I see a looming grave danger in such a twisted evangelical mindset! In their zeal to win the soul for Christianity they have lost their intellectual minds. Ironically, that spirit and wisdom is missing among today’s Bible-thumping Christian missionaries and crusading zealots, and their brain-dead evangelical supporters who want to make ‘America Great Again’! You really don't like anything not Muslim do you?